Old World Bluestem: What is it? Why be concerned? Osage and Coffey County conservation districts with local Kansas State Research and Extension units have teamed up to inform the public about the hazards of old world bluestem. A public meeting on the topic will be held 10:30 a.m.-noon, Oct. 8, 2018, at a pasture site in southern Osage County. Producers will have an opportunity to identify old world bluestem, see areas where old world bluestem was controlled by recommended herbicides, ask questions to specialists about the recovery of the native grass species or the need to reseed. A free hotdog and chip lunch will be available. Two local producers will discuss their control applications. Walt Fick, KSU range management specialist, will talk about the origin of old world bluestem, why we should be concerned, help with plant identification, and outline control options. Scott Marsh, of Kansas Department of Agriculture Plant Protection and Weed Control, will give the state’s current view of old world bluestem as a possible noxious weed. Robert Harkrader, with Quail Unlimited, will discuss how it negatively affects the quail population. 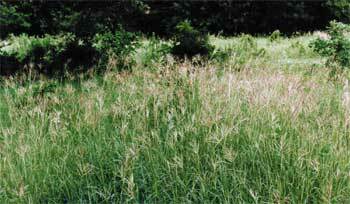 While these grasses are called bluestem they are not closely related to big bluestem or little bluestem. Old world bluestems are a group of introduced grasses from southeast Soviet Union, Turkey and surrounding areas. The old world bluestems are survivors of centuries of overgrazing. They are drought tolerant, aggressive, prolific seed producers, and are unpalatable compared to our native species. When pastures are overgrazed or stressed by drought, the old world bluestem invade into our native range and reduce the productivity of our pastures. Once old world bluestem invades a pasture the control currently used is herbicide. In Osage County, old world bluestem can be found in pastures, hay meadows, road ditches (concerns about spreading to pastures), Corps of Engineers land, and state owned right of ways. These grasses are going to be hard to control, so early identification and control will be necessary to prevent further spread. Please plan to come to the Oct. 8 meeting to learn about this serious problem. For more information, contact Rod Schaub, Frontier District Extension agent, at 785-828-4438. Directions from Beto Junction (Interstate 35 and U.S. Highway 75): Go north on U.S. 75 to 341st Street, west to Lewelling Road, north to 333rd Street, and west 1/4 mile. Watch for signs.